As of today, MLS data indicates a YTD average sale price in the metro area of $333,402 for 2015, up 9% from the 2014 average. 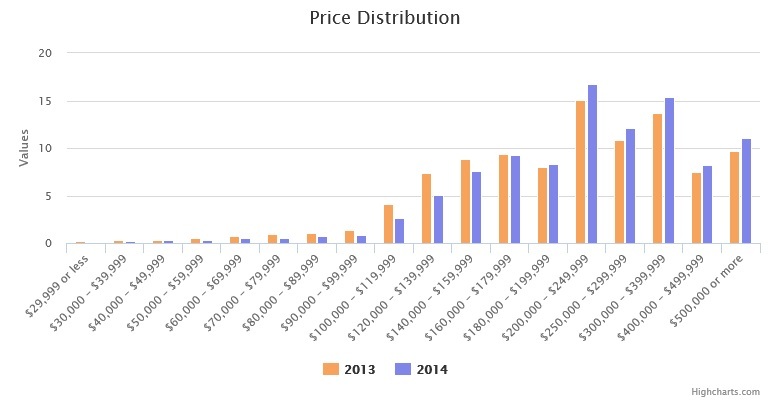 Final price distribution data for 2015 isn’t available yet, but based on this historical information, some have concluded that Austin real estate is “over-valued,” or in “bubble territory.” As I have written before, though, there is a difference between price increases created by speculative investments, and real increases in property value driven by the forces of supply and demand (see Another “over-valued” report). With unemployment in the 3% range, job growth is largely keeping pace. Between 2005 and 2014, the metropolitan area’s population grew 34%, from 1,453,358 to 1,943,299. 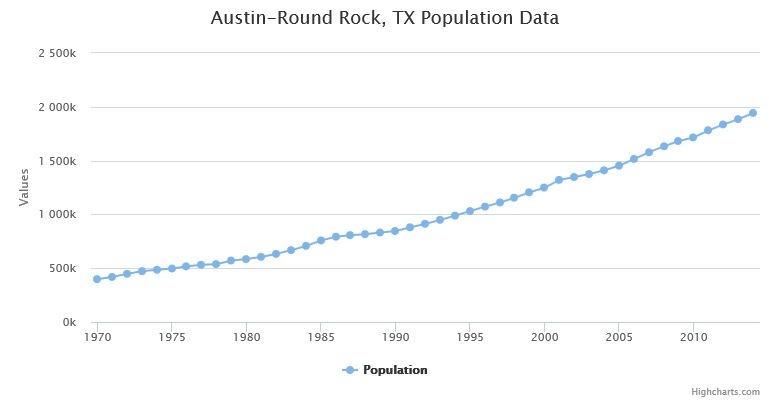 The Austin Business Journal reported this week that the City’s demographer estimates the area population as of October 1, 2015 was 2,020,452. If we assume 2.5 individuals per household, that means that we added about 30,000 households in the first 10 months of 2015! 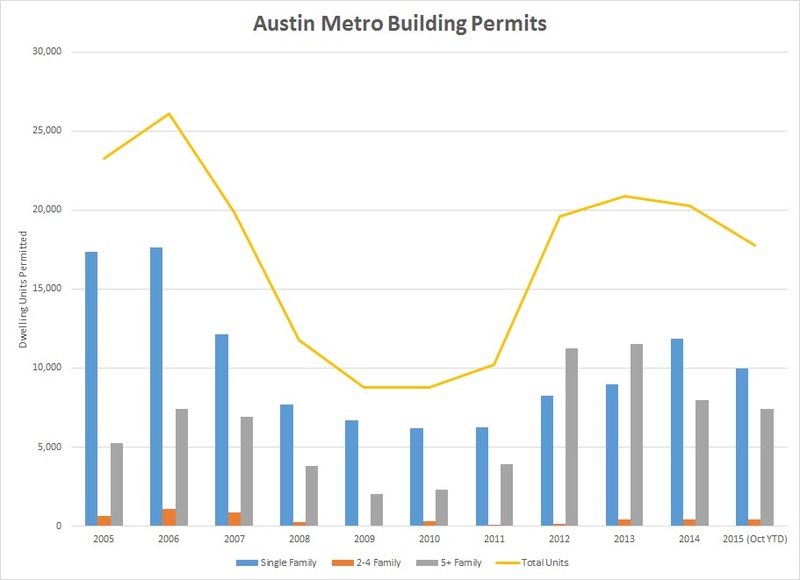 Permitting activity for new single family homes has been increasing since 2011, but plans for new 5+ family properties have declined since peaking in 2013. 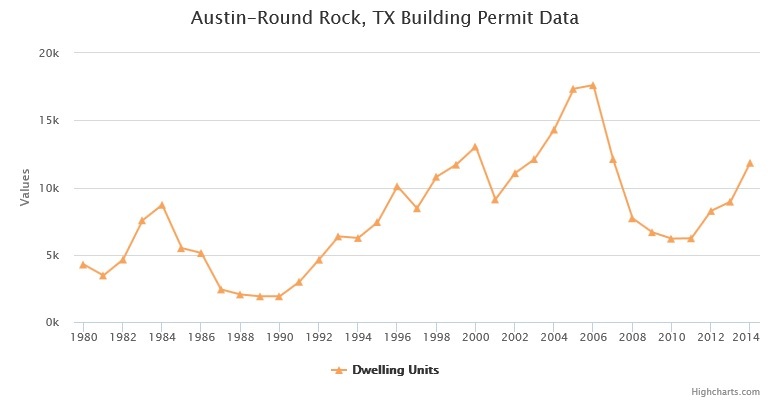 If we assume that the last two months of 2015 equal the monthly average of the first ten months, then total dwelling units permitted this year will be essentially flat compared to 2014, and will be just 80% of the number of permits issued at our 2006 peak! So based on this admittedly simple analysis, we have gained about 40,000 more households than we have homes for. Generally, the closer you are to the center of the metro area, the more expensive property is. That is forcing more and more people to move to the periphery of the area (and beyond). This is not hopeless, however. There are ways to address this trend, by allowing the addition of much more, and more varied, housing stock throughout the area. It will require bold action by leaders in Austin and surrounding communities. It will require facing and accepting change. Done properly, though, the result can be many attractive, vibrant, and more affordable neighborhoods all over Central Texas, and a way to continue the cultural and economic vitality that make Austin Austin. I will write separately in the coming weeks and months about Austin’s relative affordability compared to other major metropolitan areas, and about steps that can help to improve affordability over time without sacrificing livability. 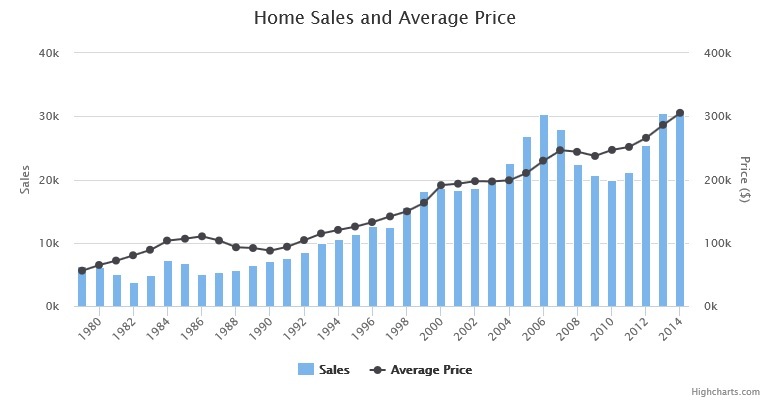 Yes, home prices are up here, and for good reasons, but the future can still be bright.